For all classes of poultry. Feed at the rate of 9 pounds per 100 birds per day. Always provide adequate water. Outside our dealers’ service area? 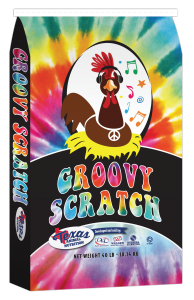 To inquire about having Groovy Scratch shipped to you please call 940-365-9710.